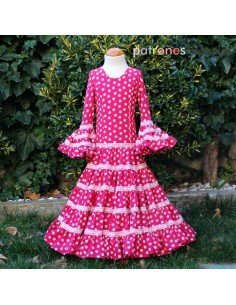 Pattern to make flamenco dress girl poplin, batiste or cotton. 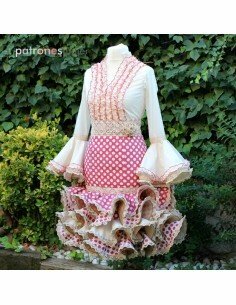 Dress with three ruffles on the skirt and two sleeves. The bodice is lined. Sizes 1-12 years. PATTERN PRINTED ON PAPER. Pattern to make flamenco dress girl poplin, batiste or cotton. Dress with three ruffles on the skirt and two sleeves. The bodice is lined. Sizes 1-8 years. PATTERN PRINTED ON PAPER. 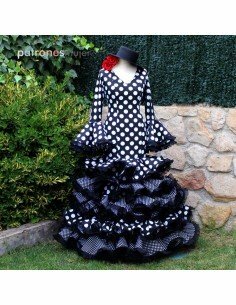 Pattern to make flamenco dress girl poplin, batiste or cotton. Dress with three ruffles on the skirt and two sleeves. The bodice is lined. Sizes 1-8 years. 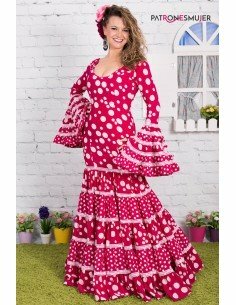 Flamenco set pattern composed of blouse and skirt with three ruffles, made in poplin. It is from 1 to 12 years old. PATTERN PRINTED ON PAPER.